Republicans have been successful at “playing the refs” with false claims of liberal bias, helping them get away with spreading their misinformation. Liberal blogs and magazines, have commented a lot on Mitch McConnell’s absurd statement in support of the popular and successful Kynect exchange site while attacking Obamacare, which makes Kynect possible. Fact checkers have debunked this claim months ago. However the mainstream media is paying little attention to this–considerably less than the far less significant refusal of Alison Lundergan Grimes to say who she voted for. During the debate, McConnell said he’d be “fine” with it if Kentucky decided to hold on to Kynect if and when Republicans repeal Obamacare. The subtext of Holmes’s tweet is that Kynect would simply become a hub for the kinds of plans that existed in Kentucky before Obamacare. After all, it’s true there was an insurance market (a non-group market) before there was Obamacare. It could follow that McConnell’s proposition is perfectly reasonable. But there were also websites before there was Kynect. One of those websites is a Kynect-like exchange called ehealthinsurance.com. Yet somehow, before Obamacare and Kynect came along, it wasn’t processing half a million Kentuckyians a year. The uninsurance rate in Kentucky was extremely high and showed no signs of falling on its own. That’s because prior to Obamacare, the non-group market was dysfunctional. It excluded and priced out the sick and poor. It offered decent plans to young people who posed minimal health risks, but also sold junk policies that left people who believed they were doing the responsible thing exposed to medical bankruptcy. It took Obamacare (and, thus, Kynect) to transform that market into something that proved inviting to half of Kentucky’s uninsured population almost overnight. Take away Obamacare, and Kynect might still exist as a website. But it’d be about as useful to Kentuckians as ehealthinsurance was prior to last year. Not totally useless, perhaps, but dramatically diminished and completely superfluous. You need to know all this if, as a political reporter, you’re going to dismiss the McConnell camp’s spin and call him out as clearly as you (presumably) called out Grimes. Likewise, when McConnell implies that Kentucky could simply replicate the ACA’s private insurance expansion and its Medicaid expansion, you need to know that Kentucky probably couldn’t—and certainly wouldn’t—ever do it on its own. McConnell is suggesting that Kentuckians replace a valuable, paid-for federal benefit with one that would impose steep new burdens on the people of the state alone, knowing it’ll never happen. Once you grasp it all, then it becomes obvious why McConnell’s contradiction is theoretically so dangerous. He isn’t just painting a shiny gloss on a controversial position. He’s exploiting the public’s confusion over it, playing voters for fools by peddling absurdities. Something that can come to define a campaign just as easily as Grimes’ political cowardice might ultimately come to define hers. This isn’t the only dishonest statement to come from Republicans in recent debates. Tom Cotton, Republican Senate candidate in Arkansas, made an absurd claim that people with pre-existing conditions were better off before the Affordable Care Act. I happened to listen to the debate in Virginia on C-Span, hearing Ed Gillespie make multiple false claims, such as repeating the Republican lie that Medicare is being cut to pay for Obamacare. …in the last few years, there’s a baseline of crazy from the right that the press has simply come to expect and accept, so the latest conspiracy theorizing or far-out idea from a candidate no longer strikes them as exceptional. Sure, there are exceptions: For instance, Republicans Sharron Angle and Christine O’Donnell both saw their candidacies derailed by their crazy or outsized statements. But their utterances were truly, deeply bizarre or comical, so they broke through. But during this cycle, Republican crazy just hasn’t broken through at all. It’s almost as if the national press has just come to accept as normal the degree to which the GOP has moved dramatically to the right. At this point so many prominent Republicans have said insane things that after a while they go by with barely a notice. This is an era when a prominent Republican governor who wants to be president can muse about the possibility that his state might secede from the union, when the most popular radio host in the country suggests that liberals like Barack Obama want Ebola to come to America to punish us for slavery, and when the President of the United States had to show his birth certificate to prove that he isn’t a foreigner. So ideological extremism and insane conspiracy theories from the right have been normalized. Which means that when another Republican candidate says something deranged, as long as it doesn’t offend a key swing constituency, reporters don’t think it’s disqualifying. And so it isn’t. …American political parties always face a tension between their establishment and ideological wings. On the Republican side, going back more than a hundred years to the Teddy Roosevelt era, that was a struggle between moderate progressives and conservatives. In our 2012 book, “It’s Even Worse Than It Looks,” Tom Mann and I described the Republican Party as an “insurgent outlier.” That is even more true today. The energy and driving force in the party, in its House membership, media dominance, caucus and primary electorates and financial backers, is not its conservative wing but its radical side. Ornstein is probably right that this will pull the Republicans even further to the right, but how far right can they go before even safe Republican districts are at risk? Will Republicans in these districts support any lunatic with an R after his name, or is there a limit? At the moment it appears that Brat should win, but the narrative would certainly change if the victory by such an extremists were to cause the Republicans to lose a safe Republican district. Yesterday I noted Brat’s views on slashing spending on Medicare, Social Security, and education. His plan to replace Obmamacare is just as absurd: “We need to also scrap employer-based health insurance, and give those incentives to individuals to carry their own portable health insurance. If we did that, the issue of pre-existing conditions largely goes away.” This makes absolutely no sense as the individual market has been dominated by insurance plans which have been the most abusive at denying coverage to the sick. “Can someone who was outraged that George Zimmerman was found not guilty of ‘SOMETHING ANYTHING’ and who is simultaneously pro-choice explain the logical dissonance there? Ie. Why its not ok to kill someone who is banging your head into concrete but its ok to kill someone for simply existing who, through your conscious actions, you brought into the world?” Werrell had written in an Oct. 24, 2013, posting. On Oct. 25, 2013, he called for an end to the regulation of prescription drugs, citing a story from the Ludwig von Mises Institute. “Abolish the FDA!” he wrote. Brat is far more likely than Cantor to make a major gaffe. It will be interesting to see his take on the views of his campaign manager. Cantor’s boss, John Boehner is, according to Nancy Pelosi, “the weakest speaker in history.” Less than 50 percent of Republicans approve of his performance. Over the last two years, he has repeatedly retreated in the face of opposition from rank-and-file conservatives who treat him with barely disguised disdain. Until the defeat of Cantor, his most likely heir apparent, it was widely assumed that he would soon either step—or be pushed—aside soon. In the Senate, Minority Leader Mitch McConnell only avoided Cantor’s fate by attaching himself to his Kentucky colleague Rand Paul, whose upstart Senate candidacy McConnell had opposed. 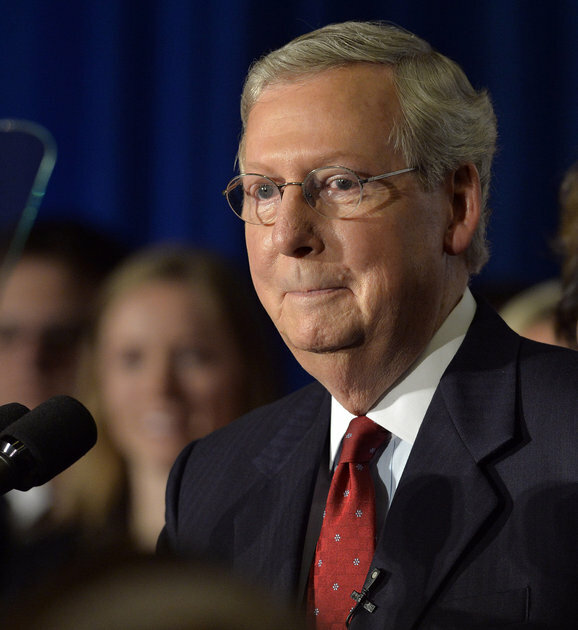 Like Boehner, McConnell is treated with striking disrespect in his own caucus. At some point, Republican leaders must recognize that they have a fight on their hands whether they like it or not. If they refuse to join that fight, they will be devoured anyway. If they surrender, they condemn the whole conservative project in America to the destructive leadership of fanatics (and the cynics who make their living by duping fanatics). I never thought there was much of a chance of Grimes to beat Mitch McConnell despite being close in the polls but today Political Wire reported that “A new Magellan Strategies (R) poll in Kentucky finds Allison Lundergran Grimes (D) leading Sen. Mitch McConnell (R) by three points in the U.S. Senate race, 49% to 46%.” Perhaps a major reason that Cantor was defeated is general bipartisan disgust with the Republican leadership, and if so this just might extend to knocking out McConnell. In response to the issue discussed yesterday where Mitch McConnell simultaneously opposed the Affordable Care Act and supported Kynect, the computer exchange set up in Kentucky as part of the Affordable Care Act, Glenn Kessler exchanged email with Jesse Benton, McConnell’s campaign manager. Benton made some absurd statements such as that, “When Obamacare is repealed, Kentucky can choose to continue Kynect or alter it in a way that makes the best sense for Kentuckians.” As discussed yesterday, Kynect cannot exist without Obamacare. Medicaid existed before Obamacare and will continue to exist after repeal. Kynect is not Medicaid. It is a state administered exchange that provides a marketplace for private insurance plans. While some 300,000 Kentuckians discovered they were eligible for Medicaid through Kynect, they do not purchase private insurance through the exchange; they are enrolled in the state-administered program. The expansion of Medicaid is another aspect of the Affordable Care Act, with the federal government paying the bulk of the cost of this expansion. If Obamacare is repealed, there would not be either Kynect or the expanded Medicaid program which many in Kentucky have benefited from. Benton also claimed that people in Kentucky “would move back to HSA’s and other higher deductible plans they had pre-Obamacare to receive a higher quality of care.” However there were no previous plans for most of these people as 75 percent of the newly insured in both Medicaid and the exchange were previously uninsured. High deductible plans and HSA’s work well for upper income individuals, but they are not a good solution for those with lower incomes who cannot afford to pay high deductibles or place money in HSA’s. McConnell appears to have accepted the Medicaid expansion that has been so embraced by his state’s residents, while drawing a distinction with the Obamacare health plans sold on the statewide exchange. Given that three out of four of the newly insured in Kentucky ended up on Medicaid, that probably makes political sense—and also is newsworthy. But the history of individual state exchanges shows it is not credible for McConnell to suggest that the state exchange would survive without the broad health-care system constructed by the Affordable Care Act, such as an individual mandate and subsidies to buy insurance. Given the popularity of the state exchange, McConnell appears to want to offer out hope it would continue even in the unlikely case the law was actually repealed. That’s likely not a tenable position, and we will pay close attention to McConnell’s phrasing on this issue in the future. The senator is clearly trying to straddle a political fence; when doing so, it’s easy to lose your balance. I do find it strange that Kessler decided to review the exchange with the above conclusion “rather than a traditional fact check.” These statements from McConnell and his campaign manager are clearly dishonest. Kessler has declared statements which were far more ambiguous to be dishonest in the past. I do applaud his decision to concentrate on reviewing the facts as opposed to jumping to awarding Pinocchios, but hope that this new policy applies to both parties. In related news, a new Wenzel Strategies poll (a Republican pollster with a reputation for a strong pro-Republican “house effect”) has Mitch McConnell leading Democratic challenger Alison Lundergan Grimes by 47 percent to 44 percent. The closeness of the race is encouraging but it is hard to see Kentucky voting in a Democratic senator. Now that people are experiencing the advantages of the Affordable Care Act it is becoming harder for Republicans to call for repeal. While people might tell pollsters they dislike Obamacare, they also oppose the consequences of repeal. In Kentucky, people might say they dislike Obamacare, but they certainly do like Kynect, their highly successful insurance exchange. This is resulting in problems for Mitch McConnell who has been calling for the repeal of Obamacare and is now up for reelection. “If Obamacare is repealed, Kentucky should decide for itself whether to keep Kynect or set up a different marketplace,” McConnell campaign spokeswoman Allison Moore told WFPL. McConnell is being dishonest with his claims that premiums are skyrocking and Medicare is being cut. One reason people in Kentucky support Kynect is that it is allowing them to obtain health insurance at a lower cost. Republicans are resorting to scare tactics with claims of Medicare cuts. Nothing could be more connected — or should be more important to Kentucky’s senior senator — than the fates of the more than 400,000 Kentuckians who are getting health insurance, many for the first time, and the federal Affordable Care Act, which is making that possible. Repeal the federal law, which McConnell calls “Obamacare,” and the state exchange would collapse. Kentucky’s exchange also could not survive without the federal funding and tax credits that are helping 300,000 previously uninsured Kentuckians gain access to regular preventive medicine, including colonoscopies, mammograms and birth control without co-pays. As a result of a law that McConnell wants to repeal, one in 10 of his constituents no longer have to worry that an illness or injury will drive them into personal bankruptcy or a premature grave. Repealing the federal law would also end the Medicaid expansion that is enabling Kentucky to expand desperately needed drug treatment and mental health services. Kynect is the Affordable Care Act is Obamacare — even if Kentuckians are confused about which is which. Just for the record, McConnell saying that Kynect can survive the repeal of Obamacare is like saying that the Oklahoma City Thunder can trade Kevin Durant, but keep his jump shot. The Kynect website and call center was paid for with federal money from the ACA, specifically $252 million in federal grants. Without the ACA, Kentucky foots the bill for a website that is worthless. Over 300,000 Kentuckians gained Medicaid coverage because the ACA expanded Medicaid eligibility and Kentucky did not opt out, and that coverage is 100 percent paid for by federal money under the ACA, until it becomes 90 percent after a few years. Without the ACA they are no longer eligible, unless Kentucky changes their state law and pays through nose to cover these new people (that is not happening). Most of the 82,795 Kentuckians who bought private insurance through Kynect were able to do so with the help of federal subsidies only made possible by the ACA. Without the ACA, those plans that have strong consumer protections on preexisting conditions, not being dropped from coverage for getting sick, and spending caps are no longer mandatory, so they’re gone. Gone as well is the requirement that children must be covered under their parents plans through the age of 25. Without the ACA many of these people won’t find someone to insure them, and many are forced to go back to junk plans that are worthless when you have a medical emergency or plans that are unaffordable without federal ACA subsidies. Without the ACA, Kynect is nothing but a worthless website that would soon go dark, and roughly 400,000 Kentuckians will lose their coverage and the consumer protections it provides, and will therefore be thrown back into the old healthcare system that had failed them beforehand. What McConnell is hoping to do with this strategy is deceive Kentucky voters who like what Kynect is doing but have a negative perception of the Affordable Care Act, and hope that the media here will do lazy “He said, She said” reporting that does not explicitly point out that what McConnell is saying is flatly false. He might turn out to be successful on that front, but this might also be a good opportunity for Alison Lundergan Grimes to get off of the sidelines and actually talk about health care with the media and voters so they know exactly what McConnell is trying to do, and have an honest conversation about what she would do. Or, she can continue staying out of this fight, and just hope for the best. Your call, Alison. Mitch McConnell has been in the fantasyland that is Washington for so long that he cannot tell the difference between fact and fiction. McConnell has voted to destroy Kynect — and he has said he will do it again. In the U.S. Senate, Alison Lundergan Grimes will fix the law to ensure it is working for all Kentuckians. This seems somewhat defensive. It again leans heavily on a vow to “fix” the law, and doesn’t state flatly that Kynect is a policy success. Some Dems, such as Rep. John Yarmuth and pollster Celinda Lake, have suggested Grimes go further. Lake told me the other day that her polling has showed that Kynect polls positively in Kentucky, even as the law known as “Obamacare” or the “Affordable Care Act” remains under water. Still, given the tentativeness of Grimes’ statement, clearly she is still not prepared to cross over into seriously making an issue out of that contrast, and it just won’t be a central point she makes. As noted here before, I understand all the reasons for Grimes’ reluctance. While it is understandable that Democrats would show some reluctance to being associated with Obamacare, failure to speak out probably guarantees their defeat. Democrats need to go on the offensive and take credit for the benefits of the law their party passed. Trying to distance themselves will not work. Everyone knows that this is a policy passed by the Democrats. Acting scared only reinforces the negative views and makes Democrats look weak. As long as Democrats remain afraid to forcibly speak out about the benefits of Obamacare and explain its benefits, voters will fall for the type of deception Mitch McConnell is practicing. Voters do want the benefits of Obamacare, and the popularity of Kynect gives Grimes the perfect opportunity to speak out in its defense. Update: Glenn Kessler reviewed the facts regarding the above issue.